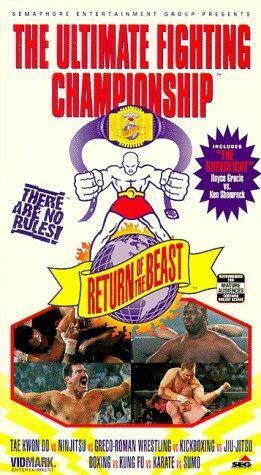 Seeing wrestlers in the UFC today is by no means out of the ordinary, but there was a time when it was. UFC 4 was the first time we saw elite level wrestling in the UFC and it came in the form of Dan “The Beast” Severn. Severn was a two time national champion in high school before moving on to become a two time NCAA Division I All-American at Arizona State University. This was apparently just the right combination for the UFC. In his first UFC event, Severn made it all the way to the final match of the tournament. After losing in the finale to Royce Gracie, he came back even more determined in UFC 5, not only making it to the finals, but winning it all in devastating fashion: less than nine minutes total. Severn also won the Ultimate Ultimate 1995 tournament, which was hailed as the best of the best. Did I mention that he did all of this after age 36? He continued his career from there, fighting in major and minor promotions all over the world as recently as last year. That’s right, do the math. The man was fighting in professional MMA matches at age 54 and winning. As if this was not enough, Severn also had a very successful wrestling career in NWA and WWF at the same time as his MMA career. Even after 20 years of bouncing back and forth between the squared circle and the octagon, and one hundred and twenty-seven professional cage fights, Dan Severn is still on top of his game. I was given an opportunity to sit down and reflect with a UFC legend and hall-of-famer about his storied career, his bumpy road to the octagon, and even what it would take to undo his retirement. Pop-Break: So, you are a two-time all American, three-time Olympic alternate, Canada Cup gold medalist, and in the Arizona State University hall of fame. How in the hell did you end up in the octagon at age 36? Dan Severn: It’s actually a really long story, but I’ll just give you the high points. I was in the middle of training for the 1992 Olympics which was an uphill battle, and this guy offered me a job, and I turned it down to keep training. In the meantime, he moved onto bigger things down in Coldwater, Michigan. Now he calls me offering more money, profit sharing, the world. I start looking at my age and I say, I could do the corporate thing. In two week time, I sold my home, I bought a home, I started to work, and at the end of the first week, I did not have a job. I can’t find the guy all of a sudden and there were no jobs to be found. I jumped into professional wrestling and I would drive two and a half hours away to wrestle, so that my wrestling friends didn’t know about my rasslin’ career. One day I see a sign for a toughman contest. First prize, a thousand dollars. I had never been in a fight in my life, but I needed a thousand dollars. Two days and five men later, I walked out of there with a thousand dollars, and the title in that chapter of my book is called New Found Skills. PB: What was that whole experience like for you? DS: A lot of the guys were wearing boxing trunks or cutoff jeans and a tank top. I showed up with a wrestling singlet on. I’m out there with dark hair and a big, bold mustache, and I didn’t even know how to hold my hands. [Holds out his hands like the Notre Dame mascot]. I probably looked like John L. Sullivan practicing the Queensbury rules in the etiquette of boxing. However, I quickly found out, this was not boxing. This was mayhem. I was brawling with these guys. This one guy came up and hit me a few times, so I grabbed him belly to belly and threw him clear across the ring. The crowd went nuts, and I remember looking at the promoter and he said “Throw him again!” I looked like a wild hillbilly out there. I had no idea what I was doing. I really wish I could find some footage of that fight. Then a buddy of mine from Detroit watched the first two UFC’s, and he brought them over so I could watch them. He asked if I could do it, while I’m watching people get soccer kicked in the face, stomped, head butted. But then I seen this other guy doing jiu-jitsu, and I said yeah let’s give it a shot. PB: Did you really know what you were in for? DS: I was only able to train for five days, and at the end of five days I walked into the world of no holds barred fighting. I don’t know if there is another man in the world that can do that at thirty-five-years old. PB: I certainly don’t think so, and after over a hundred fights, you seem pretty intact. DS: You know, my face isn’t all scarred up and beat up. My teeth are all originals. They may be a little crooked, but they’re mine. My ears still actually look like ears. My nose is still in the middle of my face. I don’t like to take any unnecessary punishment. I know when it’s checkmate. When I’m beat, I can just tap out and move on to the next fight. PB: What current fighters do you enjoy watching? DS: I really like Georges St. Pierre. I like the way he handles himself. He’s a good fighter. PB: When you went to the WWF, they played up a rivalry, between you and Ken Shamrock. I was wondering if there was a hint of truth in that, given your guys history in the octagon. DS: No, no, no. In order to hate somebody, you have to at least know them to know what to hate them for. Most of the time we spent together was in the ring, and we weren’t talking a whole lot in there [laughing]. PB: If you had to be remembered for only one fight, which one would it be? DS: My first encounter with Oleg (Taktarov). I’ll definitely give Oleg his kudos, he had an armbar on me, but back then you were allowed to grab the cage. I was able to climb the cage and get out. He ended up in a bad spot where I was above him and he was exposed. He was pulling on my kneepad and he pulled it down. Well, my knee was open, his face was open, soooooo. After the first knee, I looked up at the ref and he wasn’t stopping it, so I dropped another one. That one busted him open. I looked to the ref, and still no stoppage. I had to drop a few more, so I tried to drop them in different spots. You know, I wasn’t trying to kill the guy. There was so much blood, it actually filled up his eye socket. Finally the match got stopped. And that’s when the greatest picture ever of me was taken. Three times in that match, I asked the referee to stop it, and in the end I was covered in blood. I got up and said “You people want to see blood?” I stretched out my arms and AAAHHHHHHHHH!!!! PB: On the reverse side of that, if you could take erase one fight? DS: Royce Gracie. I wish I would have faced him in UFC 5 instead. PB: Was there ever a fight that was a little more personal for you? Someone you just wanted to beat up? DS: Tank Abbott. He’s the only person I can say I stepped into that ring with bad intentions. PB: You have fought a lot of fighters over the years. Who is someone that you think is just flat out tough? DS: There’s been a lot of them. I’d say Pat Miletich is tough. When Pat stepped into the ring against me he was giving up seventy pounds or more to me, but he hung in there and we fought for twenty straight minutes, to a draw. PB: How do feel about women being in the UFC now? DS: I think it’s great. I’ve been working with women wrestlers for years. It’s like the early days of the UFC all over again. Those girls go out there and get it. A lot of the guys these days look like someone getting ready to swim in cold water. They just kind of dip their toes in. The girls just dive right in and go after it. It’s great to watch. PB: You left the UFC before Zuffa took over, but it was actually Zuffa that inducted you into the UFC Hall of Fame. How is your relationship with the UFC currently? DS: I stopped by the UFC building to check it out, and it was sort of weird, because you can’t just walk in. You have to be buzzed in. So they asked me through a speaker if they could help me and I said “Hi, I’m Dan Severn. I’m one of your UFC Hall of Famers, and I was hoping maybe I could get a tour of your facility.” They told me someone would be right out to let me in. They brought me inside and told me Dana [White] himself would be down in a minute. They really rolled out the red carpet for me. Dana himself came down and I took probably about forty five minutes to an hour out of his time. He was very gracious as she showed me around. He took me to all the different floors and showed me things that they are working on. I have to say, I was very, very impressed. Just to walk in that building and see everything that’s going on, and what he has done for the UFC. PB: So, you’re officially retired as of this year. Why now at fifty-four years old? DS: [laughs] You just said it. I’m fifty-four years old. You know, I was in a fight, and there was a thirty year age difference between me and my opponent. After that, I contacted all of these different promotions and said, “If you want me to fight on your promotion, or if you want to utilize my skills, you better set it up before January 2013, because that is the day I retire.” It was just a date I set, and it was decision I made. PB: Well, it doesn’t sound like it’s perfectly set it stone. Is there anything that would change your mind about that decision? DS: I’ve been tossing that around in my head a lot lately, and the only way I would come out of retirement is if one of three people come calling: Mark Coleman, Royce Gracie, and Ken Shamrock. And the thing about that is one of them has already come calling. DS: Lucky guess huh? Now the thing is, is it marketable? Yes. Would it sell? Yes. Would I make it a main event? No, absolutely not. Not unless, you really want to market a geriatrics match.